Norway’s favorite Trivial Pursuit answer Thor Heyerdahl finally gets a biopic. If you always got that answer wrong, never fear; Kon-Tiki will fill you in nicely. Kon-Tiki is based on events that happened in the late 1940s. Thor Heyerdahl led a crew of half a dozen men. They sailed a hand-made raft called the Kon-Tiki, from the west coast of South America to Polynesia. Heyerdahl was an anthropologist with a new theory — that the Polynesian islands might have been populated from the West, not the East. That would mean that Polynesians came from South America, only after the Americas had been populated. By sailing a crude balsa raft, he would prove that it was possible to make the long open-ocean voyage even without large ships or sophisticated navigation. It’s an interesting theory, and it inspired a ripping adventure that lends itself well to the big screen. A great ensemble of Norwegian men populate the film — and the raft. Pål Sverre Hagen plays Thor, the young, handsome, sun-baked leader whose best traits are faith and certainty. I especially liked Gustaf Skarsgård as wiry, red-bearded Bengt, the ethnographer who wryly notes that as a Swede he feels out of place among the Norwegians. A slightly hefty Herman (Anders Baasmo Christiansen) fills the movie’s need for comic relief as the refrigerator salesman who talked his way aboard. Directors Joachim Rønning and Espen Sandberg, supported by a burgeoning Norwegian film industry, seem to have the budget to do what they want. They recreate New York City of the 1940s, when Heyerdahl was searching for funding. And when the crew finally sets sail, there are many amazing shots of the tiny raft alone at sea. You may be reminded of Ang Lee’s Life of Pi. 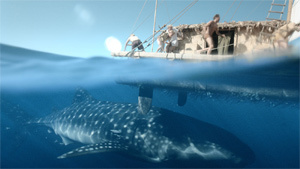 The film’s money shot seems to be an encounter with a whale shark (although seeing Knut, played by Tobias Santelmann, catch a shark with his bare hands was a treat). My first thought was how unreal the enormous whale shark looked on screen. But after reading Heyerdahl’s account, I think reality really was as strange as what’s in the movie. Since I first saw Kon-Tiki I read Heyerdahl’s nonfiction account, and I have to say that the movie does a good job at conveying the basic facts from the book, while still performing like a great summer adventure film. Maybe the best thing about Kon-Tiki is that at its core it is a story about curiosity and discovery. It fits into an adventure genre without being about superheroes, talking animals, or revenge.